Henry can't wait to help Aunt Lilla with the bees she keeps at their home near the tidal creeks and marshes in South Carolina's Lowcountry. He watches from a stump as Aunt Lilla tends the bees in her bee suit and talks gently with them. As his aunt goes about her work, Henry learns about sister bees, the queen, and bee dances. When the bees appear to be ready to swarm and leave their hive, Aunt Lilla sets up another box near their tupelo tree, but there is no guarantee the bees will move there. Henry wants to do something to help, but can he find a way to communicate with the sister bees and convince them to stay? 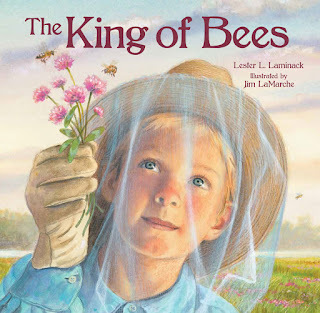 Paired with renowned illustrator Jim LaMarche’s stunning artwork and filled with facts about honeybees, Lester Laminack’s lyrical prose and sweet portrayal of a young boy’s relationship with his aunt and their bees will be a new favorite for both long-time and new fans of Laminack. The book also includes a thorough author’s note with information about bees and bee conservation. The declining honeybee population has been a hot topic in news and current events lately. So understanding these important insects and having the knowledge and tools to make a difference is becoming increasingly important, for both adults and children. "Did you know that one third of the food you consume is available on the earth only because of the pollination of bees? That if we were to lose all of the bees that we have, then one-third of our available food source would dissipate in a matter of 10 years," author Lester Laminack declared in a presentation to educators. "Now I know stuff like that because this story, though it’s fiction, is a house of fiction built on a foundation of nonfiction." When writing about bees in a fictional story, it is important to make sure the information about bees is actually true. Scattered throughout The King of Bees are tidbits of factual information that Aunt Lilla explains in a way that both Henry and the children reading the story can understand. “I have strived to achieve a lovely balance between story and information that holds the potential to lead the reader toward becoming an advocate and an ambassador for honeybees,” said Laminack. There are lots of resources to help readers learn even more about bees and to become advocates for these important insects. You can learn more about bee migration with ABC News's Ginger Zee as she follows bees on a cross-country road trip to pollinate crops in this video. And the links below are just a small sample from our resources page to learn more about how vital honeybees are and what we can do to protect them. For even more resources and ideas on how to incorporate The King of Bees into your classroom lessons, check out our common core-aligned Teacher's Guide and our resources page for readers and educators! And hear from instructional specialist and Fernbank Science Center beekeeper Kyla Van Deusen about how schools can contribute to both honeybees and native pollinator health in her guest post here. Find The King of Bees on Amazon or at your local library, indie bookstore, or Barnes & Noble!